Chelsea Garner, on behalf of the UC Davis Breast Health Center, holds a check for the 2018 Pink Patch Project. 2018 Pink Patch sales totaled $2,227. The proceeds from the sale of the patches went directly to benefit the UC Davis Breast Health Center, which offers imaging, prevention strategies, genetic counseling, risk assessment, and specialty physician patient care to people in our communities. 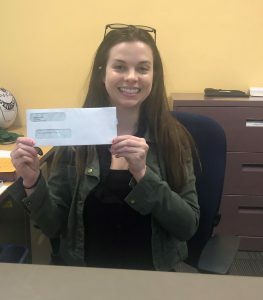 Chelsea Garner, on behalf of the UC Davis Breast Health Center, holds a check for the 2018 Pink Patch Project.